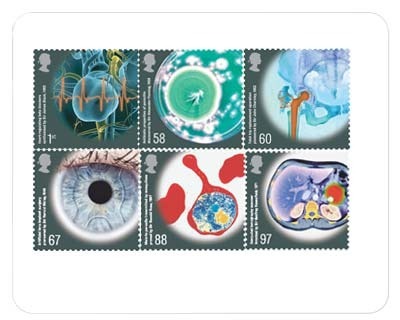 The latest set of stamps to be issued by Royal Mail feature important Medical Breakthroughs. The stamps which are due to be released on the 16th of September feature medical imagery which illustrates six selected breakthrough. They include beta blockers, penicillin, hip replacements, artificial lens implants, malaria parasites and CT scanners. Thousands of London Underground workers are due to walk out tonight in the first of a series of strikes. The strike will begin with two 24 hour walkout starting at 1700 and 2100 today. The action is taking place as part of a protest against plans to scrap 800 jobs in ticket offices. Maintenance and engineering staff will walk out at 1700 BST with drivers, signallers and station staff following suit at 2100 BST. During a strike a skeleton staff will be left to man services with the level of service depending on how many managers are able to stand in. Disruption is expected from late afternoon today and is likely to continue for most of Tuesday. Further strike action is planned for the coming months. People travelling tonight might want to check out the following link for some alternative transport options.